Drawers are 15" front to back, 3'' Deep (Although you can have them slightly "overflowing.") and 20'' wide. There are seven of them. The place where the coffee maker goes (We had it removed) is 18.5 front to back, 23" high and 20 " wide. There is a shelf above that is 6.5" high. There is also space above the 4 drawer set in the closet, if you don't mind having your pants/shirts brushing what ever you place there. Finally, there is a shelf on the other half of the closet that is 18" front to back, 26.5" wide and 6.5 ' high. All these measurements from Viking Sun, DV3 room. best way to get local money? Never had US Dollars refused for a tip. Use bank ATMs for local currency if required, but a credit card works in most places. Certainly in Sweden and Denmark. On WC now and no way would pay fees for all the different currencies required. ATMs in Rio de Janeiro were out of cash on a Sunday, but a Money Exchange filled the bill. Viking has independent tourists report to the atrium and works them in with scheduled tours. When we book independent tours we expect the operators to take into account tender operations. So far that has always worked, except for a tour in New Zealand. Rough seas delayed tendering and the tour departed without us. The operator refunded all fees. Some have a nonrefundable deposit like independent operators on Easter Island. Those that had booked tours with those operators on our stop there 19 Feb 2019 lost that deposit. You pay your money and you take your chances. On our Viking cruise, they room steward regularly placed a thermos carafe with very hot water and replenished tea bags so that I could have hot tea morning, noon or night. While it wasn't boiling, I was always able to brew tea ( I like mine very strong) no matter the time of day. BTW- The carafe was apparently used for hot water only. No coffee after taste as is often the case. Test to see if I can post pics. Luggage Forward shipment. Believe I have the secret. See you all on board. Merry Christmas! All waste water is stored on the ship, ocean or river. We stayed in 7012 and booked same for the upcoming round the world cruise. Never heard anything from the lounge and used the the entrance to the lounge by your cabin. If I recall correctly, it has a "vestibule" entrance with the door out to our deck opening to a small vestibule and another door to the lounge. There is a piano and some entertainment at cocktail hour, but I don't recall any late evening events. The nice thing is the morning coffee service set in the lounge each morning. Just a short walk for a caffeine hit. I reposted for this year's WC HERE. No World Series on Viking Star! I might be reading too much into some of the replies, but don't understand the "hostility" by some on this topic. The pool screen uses wireless headsets and what someone watches in their room won't "bother" anyone. It's been a great World Series. It was a great World Cup with the UK surprising many. I'm glad I got to see both. Will be on the World Cruise for the Super Bowl, but in the Beagle Channel, so doubt availability of satellite coverage. I figure this guarantees my favorite team will be playing. (Oh the sacrifices I'm making.) On the other hand--Glad the Jayhawks won. Not too surprised. Baseball and American football not followed around the world like soccer or even cricket so games not on readily available and cheap satellite links. I figure we can restock as required at one of the Australia stops. No language barrier (OK maybe a slight one), reasonable cost, and halfway through. So maybe just 3 bottles purchased in Miami. When on the Sky in 2017 there was only one channel that played music, the bridge camera if I recall correctly. Have they added additional channels on the Sun? Several articles in London Times with outlining issues about British passport control. They are adding agents, but it seems to be an issue at all ports of entry. No dates given for it to get any better. Lived in Cairo for two years. Would not pay for dinner and Khan tour. You can do on your own with taxi service unless dinner is something special with some sort of show. Abu Simbel and the Philadelphia light show are not to be missed. An on ground tour in Luxor and side trip to Valley of the Kings would be of much more value to me, vs hot air balloon ride. The area either side of the Nile is green for about 15 miles, the rest is desert. Weather should be great 74F low 49F in Luxor. In the desert that can be chilling. On Barcelona,The Baltic & Beyond last year there was a self-directed group who met regularly in the fitness center. Re: Luggage Shipment—Bottomline Up-Front—Doubt we will usethe luggage forwarding service. 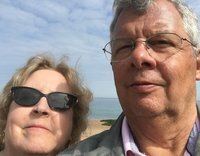 We did Barcelona,The Baltic & Beyond for 22 days aboard Viking Sky and with extensionsbefore and after for 26 days total departing 15 April with two regular suitcases and twocarry-ons. Itinerary included StPetersburg so we had heavy winter coats and sweater layers. (BTW- Temperatures for WC 2019 have low rangeof 41-53F in Ushuaia, Argentina to 69-89F in Walvis Bay, Namibia for our travelmonths and an average 9.5 inches of rain in Rio de Janeiro, Brazil) VO’son-board launderettes and three sea days kept us in clean clothes. We’re planning to hit CVS in Miami forconsumables, knowing that New Zealand and Australia are just past the halfwaypoint and we can restock there is required. Have already discussed prescription drugs with provider and insurancewho confirm a “vacation” order will be filled in advance of our departure. My winter Mediterranean cruise is on sale but Viking won’t rebook at lower fare. The Jan 2019 World Cruise also had a price reduction, considerable as you might imagine. My response from Viking- "Thank you for your recent email. At this time we are not offering pricing promotions and or incentives to passengers whom are already booked under deposit. If you have other general questions please advise. Kind regards, Viking Cruises"